If the selected partition is a multilingual partition, you must select a Language to work with. This will be the default language for the current session of LANSA. Specify the current language to be used by LANSA in the selected 3.3.4 Partition. The list of languages displayed is specific to the selected partition. Note: The current language selected for the partition and the development language as specified in the Development Language settings are not the same. 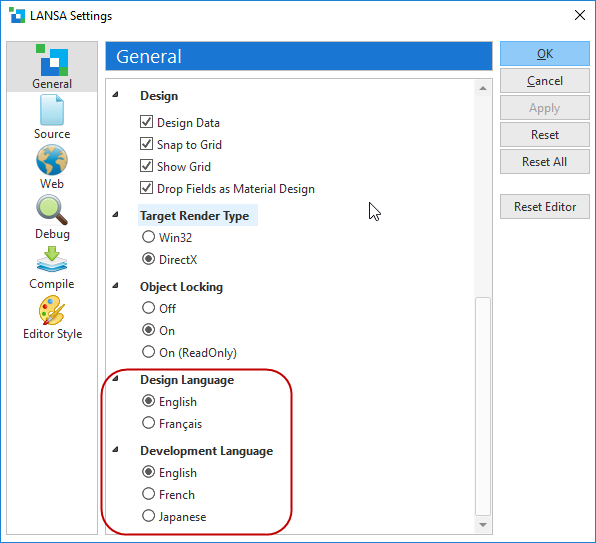 The development language determines the language of the LANSA development environment used the next time you log on to Visual LANSA. 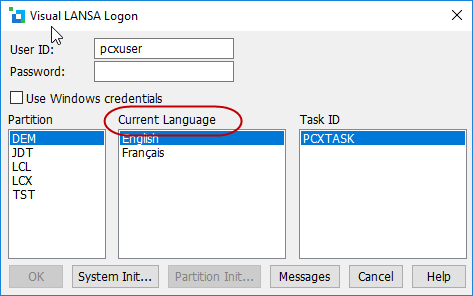 The language specified for the partition determines the default language for language-specific objects in your LANSA applications such as labels and the language used when the application is executed. The Design View Language is set to the current language but can be changed as required.